Not much in the way of cycling in the last week. My routine has been altered somewhat in the last week. I’ve taken a new job and started it on Monday. Gone is my short bicycle commute to work. In its place, a commute more like the rest of the working world that does the regular 30 minute slog by car. The good news though is it stands to be a more interesting position so despite the longer commute, overall positive. The first order of business was to pack my bags for a meeting in Florida. Daytona to be exact. 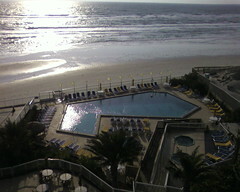 As you can see from the picture here, my room for the week has a pretty nice beach front view. Not a bad office to start things off. Short lived of course. For a city with as many big high rise condos/hotels, the streets seem amazingly free of people. The wind has been howling here along the beach. In the morning’s the sand and seaspray covers the car to the point it’s hard to even get it off with the windshield wipers/spray. Sure wish I could find a decent cup of coffee in this neighborhood. Rats! missed that one. If you can believe it, I ended up with 7-11 coffee across from the hotel one morning, and I was glad to have found it. Desk clerk at the hotel said there was a Starbucks 4 miles up the road. I was tempted, but I opted not to walk the 8 miles for coffee. Next time *I* rent the car! decent coffee in daytona . . . must head to java junction, but that’s not on beachside . . .